Zinovy Petrovich Rozhestvensky was an admiral of the Imperial Russian Navy. He was in command of the Second Pacific Squadron in the Battle of Tsushima, during the Russo-Japanese War. In naval warfare, a "fleet in being" is a naval force that extends a controlling influence without ever leaving port. Were the fleet to leave port and face the enemy, it might lose in battle and no longer influence the enemy's actions, but while it remains safely in port, the enemy is forced to continually deploy forces to guard against it. A "fleet in being" can be part of a sea denial doctrine, but not one of sea control. The Battle of the Yellow Sea was a major naval battle of the Russo-Japanese War, fought on 10 August 1904. In the Russian Navy, it was referred to as the Battle of 10 August. The battle foiled an attempt by the Russian fleet at Port Arthur to break out and form up with counterparts from Vladivostok, forcing them to return to port. Four days later, the Battle off Ulsan similarly ended the Vladivostok group's sortie, forcing both fleets to remain at anchor. Wilhelm Withöft was a Russo-German admiral in the Imperial Russian Navy, noted for his service in the Russo-Japanese War of 1904-1905. Hatsuse was a Shikishima-class pre-dreadnought battleship built for the Imperial Japanese Navy by the British firm of Armstrong Whitworth in the late 1890s. The ship participated in the early stages of the Russo-Japanese War of 1904–1905, including the Battle of Port Arthur on the second day of the war. She was involved in the subsequent operations until she struck two mines off Port Arthur in May 1904. The second mine detonated one of her magazines and Hatsuse sank almost immediately afterwards with the loss of over half her crew. Shikishima (敷島) was the lead ship of the Shikishima class of pre-dreadnought battleships built for the Imperial Japanese Navy by British shipyards in the late 1890s. During the Russo-Japanese War of 1904–1905, the ship fought in the Battles of Port Arthur, the Yellow Sea and Tsushima and was lightly damaged in the latter action, although shells prematurely exploded in her main guns in the latter two engagements. Shikishima remained in home waters during World War I. The ship was reclassified as a coastal defence ship in 1921 and served as a training ship for the rest of her career. She was disarmed and hulked in 1923 and finally broken up for scrap in 1948. The Petropavlovsk class, sometimes referred to as the Poltava class, was a group of three pre-dreadnought battleships built for the Imperial Russian Navy during the 1890s. They were transferred to the Pacific Squadron shortly after their completion in 1899–1900 and were based at Port Arthur before the start of the Russo-Japanese War of 1904–1905. All three ships participated in the Battle of Port Arthur on the second day of the war. Petropavlovsk sank two months after the war began after striking one or more mines laid by the Japanese. Her two sister ships, Sevastopol and Poltava, took part in the Battle of the Yellow Sea in August 1904 and were sunk or scuttled during the final stages of the Siege of Port Arthur in early 1905. 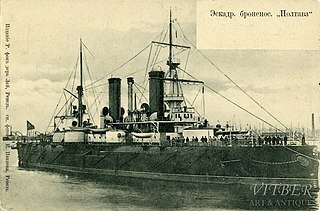 The Russian battleship Poltava was one of three Petropavlovsk-class pre-dreadnought battleships built for the Imperial Russian Navy in the 1890s. The ship was transferred to the Pacific Squadron shortly after completion and based at Port Arthur from 1901. During the Russo-Japanese War of 1904–05, she participated in the Battle of Port Arthur and was heavily damaged during the Battle of the Yellow Sea. She was sunk by Japanese artillery during the subsequent Siege of Port Arthur in December 1904, but was raised by the Imperial Japanese Navy (IJN) after the war and renamed Tango (丹後). The cruiser Bayan was the name ship of the four Bayan-class armoured cruisers built for the Imperial Russian Navy in the first decade of the 20th century. The ship had to be built in France because there was no available capacity in Russia. Bayan was assigned to the First Pacific Squadron after completion and based at Port Arthur from the end of 1903. She suffered minor damage during the Battle of Port Arthur at the beginning of the Russo-Japanese War of 1904–05 and supported destroyers as they patrolled outside the harbour. After bombarding Japanese positions in July 1904, the ship struck a mine and was out of action for the next several months. Bayan was sunk during the Siege of Port Arthur and was then salvaged by the Japanese after the war. Petropavlovsk was the lead ship of her class of three pre-dreadnought battleships built for the Imperial Russian Navy during the last decade of the 19th century. The ship was sent to the Far East almost immediately after entering service in 1899, where she participated in the suppression of the Boxer Rebellion the next year and was the flagship of the First Pacific Squadron. Ivan Konstantinovich Grigorovich served as Imperial Russia's last Naval Minister from 1911 until the onset of the 1917 revolution. 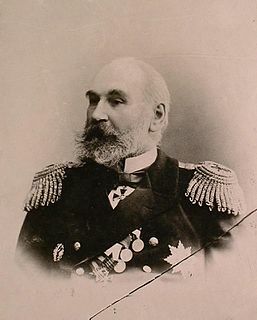 Vsevolod Fyodorovich Rudnev was a career naval officer in the Imperial Russian Navy, noted for his heroic role in the Battle of Chemulpo Bay during the Russo-Japanese War of 1904–1905. Admiral Makarov was the second of the four Bayan-class armoured cruisers built for the Imperial Russian Navy during the mid-1900s. While initially assigned to the Baltic Fleet, the ship was detached to the Mediterranean several times before the start of World War I in 1914. She was modified to lay mines shortly after the war began. Admiral Makarov laid mines herself during the war and provided cover for other ships laying minefields. The ship fought several inconclusive battles with German ships during the war, including the Battle of Åland Islands in mid–1915. She also defended Moon Sound during the German invasion of the Estonian islands in late 1917. Admiral Makarov was decommissioned in 1918 and sold for scrap in 1922. Prince Pavel Petrovich Ukhtomsky was a career naval officer in the Imperial Russian Navy, noted for his action at the Battle of the Yellow Sea in the Russo-Japanese War of 1904-1905. His family traced their lineage to the Rurik Dynasty, and had been moderately prominent boyars in the Muscovite period. He was held in scant respect by his colleagues, who felt that his rank and position owed more to family connections than any competence or ability Lt. Commander Newton McCully, American Naval attaché in Port Arthur through much of the siege noted that Ukhtomsky "was not esteemed as particularly able, but was considered a Russian patriot, and had the credit with the fleet of having forced Admiral Vitgeft to make the sortie of June 23"